Prime Minister Narendra Modi waves at the supporters during an election campaign rally in support of the BJP candidates, ahead of the Lok Sabha elections at Rash Mela Ground in Cooch Behar district of West Bengal, Sunday, April 7, 2019. In a scathing attack on West Bengal Chief Minister Mamata Banerjee, Prime Minister Narendra Modi said Sunday "speed-breaker Didi" has applied brakes on several central schemes, denying people of the benefits available in other parts of the country. 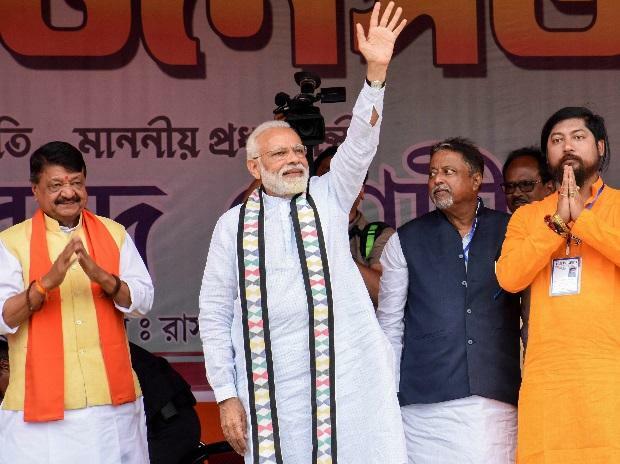 Noting that a venue with limited space was allotted for today's rally, Modi said, "Didi tried her best to stop people from attending the rally in large numbers. How does she expect to win the elections with such childish antics." "Didi has betrayed the Centre by giving protection to the intruders. This chowkidar has brought NRC and Citizenship (Amendment) Bill to drive out infiltrators. But Didi with her 'Mahamilawati' (opposition alliance) colleagues are trying to stop the government from pursuing them," he said.